In one story from Mvskoke oral tradition, it is said that an old woman was living in a certain place. She lived alone until an orphan boy came to be with her. He learned to hunt and provide meat, while she fed him tasty dishes made from a mysterious ingredient. One day he spied on her and discovered that the food came from her body: it was corn, and she was the corn mother. She taught the orphan boy how to care for this new grain, and how to use the different varieties. Then she sent him on a long journey. Later, when he returned with a wife, the old woman’s house was gone. The place was occupied instead by tall, green stalks of corn. And it has been the essential Mvskoke food ever since. Mvskoke people have acknowledged their dependence on this sacred staple from time immemorial. Even today, the most important annual event at our ceremonial grounds is posketv, known in English as “Green Corn” because it marks the ripening of a new corn crop. Each Mvskoke town celebrates separately, Bartram noted, “when their own harvest is ready.” After a period of cleaning and preparation, of fasting and purification, a new fire is struck in the town square. Green Corn thus signals the end of one annual cycle and the beginning of another. It typically happens in the days after summer solstice, initiating the Mvskoke month of Hvyuce, a designation offering further evidence of our agricultural heritage. In modern times, citizens of the Muscogee (Creek) Nation extend these traditions when they participate in the Muscogee Nation Festival, which takes place in Okmulgee following the summer solstice. The first such event was held in 1975, two hundred years after William Bartram learned the significance of Green Corn while travelling through Mvskoke country. Roasted ears and other corn-based dishes were available from vendors serving food on the Omniplex midway. Fresh, locally grown corn was for sale at the farmers market on the west lawn of the Creek Council House. Traditional games organized by Cvkotakse Seccvlke, the Mvskoke Bow Shooters Society, included a cornstalk shoot west of the Mound Building. Senior activities at the Okmulgee Elderly Nutrition Center featured a safke contest. The Senior Citizens Gift Shop, located in the main building of the capitol complex, has a great selection of homemade ingredients for traditional foods including safke corn, hominy, and dried sweet corn. It is also worth noting that the meal served before the stomp dance on Thursday evening, the official opening of the Festival, did not include dishes made from fresh corn, since some of those participating were from ceremonial grounds where they are still fasting in preparation for posketv. Industrial civilization has not been kind to corn and other living things. Mvskoke people bear an age-old responsibility to care for the vital plants that sustained our ancestors, and that will feed us and our descendants if we respect the sources of life. Mvskoke people have always appreciated the beauty of nature, and the value of color symbolism. Catē (red) is an especially powerful color that can represent many things: the east, the sun, the sacred fire; blood, sacrifice, warfare, and survival. For the dominant culture, preoccupied as it is with skin tone, red has been one of the primary colors of racial classification. Americans borrowed words from the Choctaws in naming their forty-sixth state “Oklahoma.” The literal meaning is “red people,” though the name is often mistranslated as “land of the red people,” which in turn is sometimes condensed to “red earth.” This last phrase happens to be a fairly accurate description of Oklahoma’s iron-laden soil. And “red earth” is not far removed from “Indian Territory,” which of course it was until the violence of statehood. Race is a colorful expression of manifest destiny. Mvskoke and American perceptions of the color green are much more compatible. In the dominant culture, green has been a shorthand reference to ecological concerns since the early seventies. The environmental organization Greenpeace, for example, was founded in 1971. The first green political groups emerged in the years that followed, though the United States did not have a national Green Party until 2001. Indigenous peoples have influenced the green movement throughout its short history. Mvskoke people traditionally associate lanē (green) with the harvest. The most important event of the year at our ceremonial grounds is posketv—literally, “to fast,” because fasting is such a vital part of Mvskoke religion. This observance is known in English as “Green Corn,” reflecting the fact that it marks the ripening of a new corn crop. 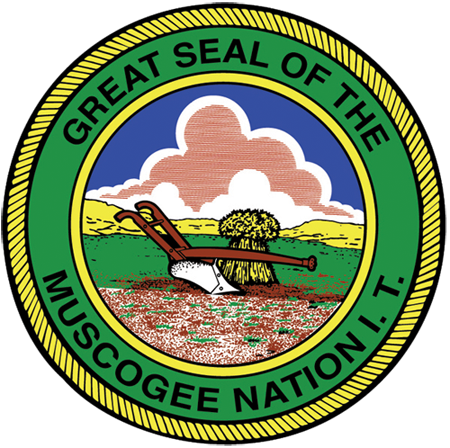 The ancient agricultural heritage of the Mvskoke people is also evident in the great seal of the Muscogee (Creek) Nation. It features a plow and a sheaf of grain standing in an open field, and the modern (full-color) version is framed by a bright green border. The Green Government Initiative addresses four areas of environmental impact: construction practices, office activity, materials recycling, and waste management. (1) It empowers the Office of Environmental Services to develop a comprehensive building code with construction requirements that are ecologically sound and energy efficient. (2) It directs all government offices to conserve energy and reduce waste in their day-to-day operations. (3) It establishes a recycling program to coordinate the collection of such materials from public and residential buildings. (4) It calls for stricter regulation of solid waste, including toxic chemicals, on lands under the jurisdiction of the Muscogee (Creek) Nation. Environmental Services staff have already begun implementing the new law; recycling bins are now available throughout the Capitol Complex. An interdepartmental task force, the Muscogee Nation Green Team, is meeting on a quarterly basis to coordinate various projects related to sustainability. A follow-up law, NCA 09-194, has authorized access to a federal Energy Efficiency and Conservation Block Grant, which will eventually create as many as twenty-five new jobs in Mvskoke country. The Green Government Initiative was sponsored by National Council representative Terrie Anderson and co-sponsored by representatives Selina Jayne-Dornan and Paula Willits. Anderson believes this endeavor puts us “on the cutting edge” of sustainability legislation. Other tribes have environmental regulations of one kind or another, but this may be the first comprehensive “green government” law adopted by a federally recognized tribe in the United States. Let’s hope that future generations will look back on ours as the time when Oklahoma started going green.